Ronchini Gallery is pleased to present the first solo exhibition in London in 15 years featuring all new works by the American artist Beverly Fishman. Fishman’s bold, polychromatic, three dimensional, wall works are inspired by the many parallels that can be drawn between pharmaceuticals and art. An experience with art is comparable to taking a pill, a fleeting moment that has the ability to induce a response that runs deep within in one’s being. 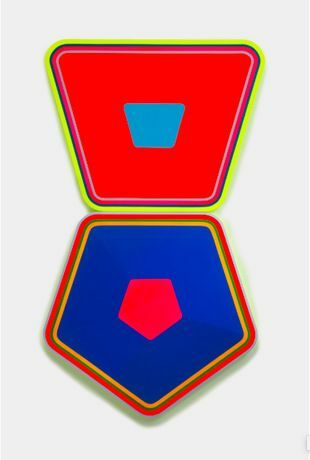 Made of urethane paint on shaped wooden panels, the works are a continuation of a series the artist began in 2012. Derived from the forms of actual pills—split and then placed in clusters like a pharmaceutical “cocktail”— the three dimensional shapes of the works enter the viewer’s space and push the boundaries of traditional paintings, which is further emphasised by the interplay between the flat and glossy finishes as well as the interaction between the work and the wall behind it. By painting the edges in glistening fluorescent paint, the works emit a subtle glow on the wall, creating a solemn monument to the drugs which inspired the pieces. The immaculate and refined surfaces of the sleek painted panels further mimic the clean and precise surroundings and branding which have come to define the pharmaceutical industry. Fishman’s art invites the viewer to contemplate not only the ways in which pharmaceutical companies use aesthetics to market their products, but also how they can create, an artificial heightened state of being, both physically and metaphorically.